Old North Mill Avoncliff - The Blog: Smiffy's Swansong - " Save the EA !! " Smiffy's Swansong - " Save the EA !! " Chris "wrong type of rain" Smith is in the news again as he seeks to undermine his boss and influence the selection of his replacement at the top of the dysfunctional Environment Agency. The "noble lord" was given a pulpit and free ride in The Guardian to attack his boss Owen Paterson and further spout his ill informed alarmist twaddle on Channel 4 News ( here at 3m:29s in ) on Thursday in another softball interview with Jon Snow - Smith yet again displays the quite towering arrogance, hubris and stultifying political correctness that we've come to expect. We do wonder if this is the start of a "Save The Environment Agency" campaign since Owen Paterson - as Smiffy's supposed boss is quite likely to have considerable sway in the choice of Smith's successor - and more to the point - the shape of the organisation after Smiffy's departure. Smith seems to have been goosed into a bit of action by the goons at the top of the EA as he's now even more untouchable than he was when actually "in post". Positioning The EA as "defenders of the planet" and proclaiming that they have some sort of climate change expertise - when the actual facts are utterly at odds with these assertions. We earnestly hope that Mr. Paterson takes a sharp axe to the EA and P45s the bad boys and gets a sensible regime in place that eradicates the carnival of waste, abuses of power, corruption and egregious repeated incompetence that the EA is actually rather good at. Unfortunately since this blog, Dave "I'm getting rid of qangos" Cameron has got rid of the one person I had confidence in sorting out the EA, Owen Paterson. His replacement has her hands full without the shenanigans of the EA. It is to be expected that a Labour Peer would line his pockets to ensure the life he has become accustomed to. The fact that he was the epitomy of the Labour Party's favourite term when last in office, Not Fit For Purpose has no bearing on the situation. Any replacement will have their hands full with the EA and as an election is looming they will not want to rock the boat and will probably promise to do something when they are re-elected. Putting it on the back burner. A challenge goes out to Liz Truss, do something to sort out the EA. Earn your pay. 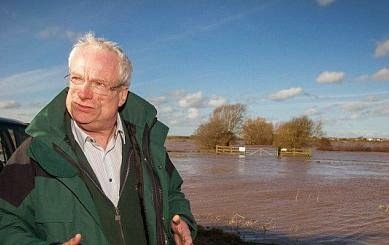 It will put you in good stead with the Farmers, the renewable energy people and the people of Somerset and many others. Get rid of this dysfunctional mess which is draining money from the coffers of England and is almost totally beyond control with no accountability.